Today’s therapy comes from Theodora Goss, whose writing is simply exquisite. Her first collection, In the Forest of Forgetting (2006) contains some of the most finely crafted fantasy stories you will ever have the pleasure of reading. Think Hope Mirrlees and John Crowley and Virginia Woolf and Delia Sherman — and even then you’re only scraping the surface of what Theodora’s writing is like. 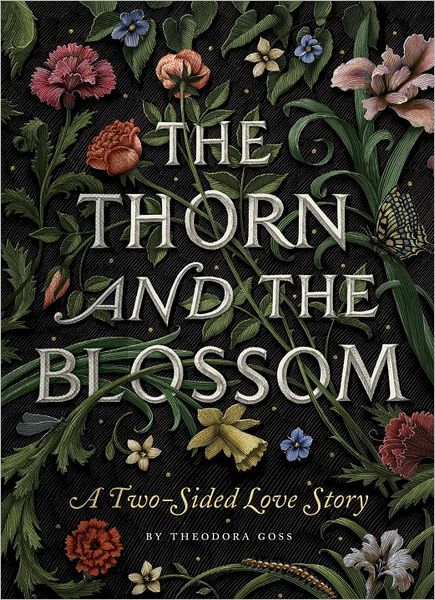 Lovely, considered prose; whimsical, engaging characters… And I am eagerly awaiting my pre-ordered copy of The Thorn and the Blossom (see the gorgeous cover, pictured left), which is a “two-sided” novella being published by Quirk Books later this month. Theodora’s advice makes a nice counterpoint to last week’s discussion on perseverance: it talks about learning to recognise the difference between working hard to reach your goal (i.e. perseverance) and persistently banging your head against a brick wall. Both require sustained effort, but the first will eventually bear fruit, whereas the second will merely give you a headache. You can’t write a story that doesn’t want to be written. What it means to me is that sometimes, you can’t write a story. We’ve probably all gotten to that point, where a story just isn’t working. We’re struggling and struggling, using all our skill, all the technique we know, and it’s still not getting written. And that’s when you have to set it aside. It may be that you’re not ready to write that story yet. It may be that you’re trying to force the story to be something it doesn’t want to be. But the story has a mind of its own, and you can’t fight it. The story will always win. I’ve called this week’s post “Letting Stubborn Stories Breathe” because sometimes that’s exactly what you need to do. It’s not a matter of completely ditching the obstinate story, but giving it some space to develop more naturally (you can’t force a mule!) and to give yourself time to gain some perspective on the piece. This is what I’ve gotten out of Theodora’s advice — and it couldn’t be more timely! Thanks, Dora! Theodora Goss has been a finalist for the Nebula, Locus, Crawford, and Mythopoeic Awards. She has appeared on the Tiptree Award Honor List and has won the World Fantasy Award (for short fiction) and the Rhysling Award (for poetry). Her website is a trove of advice, musings on art and music and writing — and she can also be found on Twitter and Facebook. You can watch the lovely ‘trailer’ for the Thorn and the Blossom here. Tags: in the forest of forgetting, stubborn stories, the thorn and the blossom, theodora goss, tuesday therapy, writing advice. Bookmark the permalink.